The portobello mushrooms in creamy curry have been on my mind ever since I had them at Vij’s restaurant a couple of months ago. I am not as familiar with Indian spices and blends and much to my dismay I was never able to decide what was used in the dish. My recent trip to Italy and the amazing mushrooms pastas that I enjoyed while there inspired me to take a new approach to the dish and go with some flavours that I was a little more comfortable with. I kept things nice and simple and flavoured the creamy porcini sauce with shallots, garlic, thyme and a healthy helping of parmigiano reggiano that was melted into the sauce. One thing that I like about using the dried porcini mushrooms is that they pack a ton of mushroomy flavour and it is really easy to capture it all by using the water that the mushrooms were soaked in in the dish. 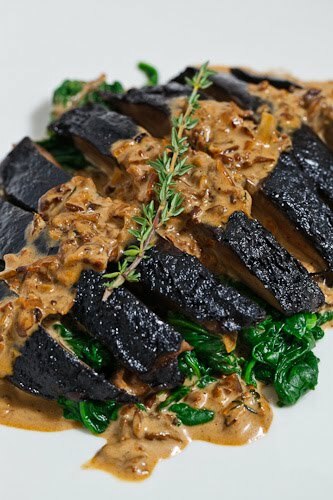 If you can still get outside and use the grill it will add a touch of smokiness to the portabella mushrooms that goes really well with the creamy sauce. If not, an indoor grill will work just fine. This version of the dish ended up being fantastic and I enjoyed it so much that I have already made it twice! The first time I served it as an appetizer with some crusty bread to soak up all of the extra creamy mushroom sauce and the second time I served it over a bed of spinach as the main dish in a lighter meal. Soak the dried porcini mushrooms in the hot water for 20 minutes. Drain the mushrooms and chop them reserving the water. Melt the butter in a pan at medium. Add the porcini mushrooms, shallots, garlic, thyme, salt and pepper and saute for 2 minutes. Add the reserved water and simmer at medium-high until reduced by half, about 10 minutes. Add the cream and parmigiano reggiano and simmer until it thickens, about 2-4 minutes. Brush the portobello mushrooms with the oil and season with salt and pepper. Grill until cooked, about 3-5 minutes on the first side followed by 3 minuted on the other side. 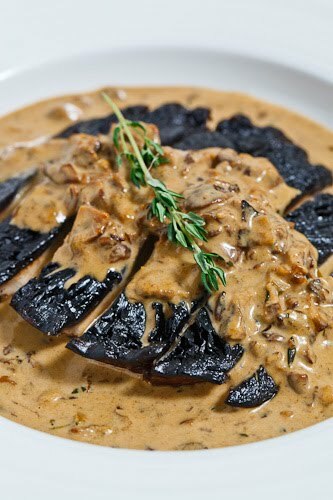 wow, what a fantastic mushroom dish! i am somewhat of a mushroom fanatic, and am always looking for ways to use them in main dishes. thanks for the recipe, it looks scrumptious! oh my goodness..this looks incredible! Oh gosh this recipe looks fantastic. I love cooking with mushrooms, especially the big Portobello's, they are delicious. That dish is wonderful! What a great idea. Giddy me, you have blown this mushroom-fanatic's mind. I have that problem with Asian and Indian food as well. Since I never ate it growing up, I don't have the fund of knowledge as to what should go in it. Italian, I can do though. This sounds delicious. gosh that looks unbelievably rich and tasty… Mmmm, I want it with tagliatelle! Oh gosh, I starred this one immediately! I've been craving mushrooms lately and looking for a new way to serve them as a main course. This looks crazy good, and I love the idea of serving the mushroom over a bed of spinach. I think I may put this on next week's menu! the first pics is just awesome! Oh my… i dont know how you managed to take this picture without diving into it! Its gorgeous… and looks INCREDIBLYU tasty. I love recreating restaurant faves at home. its like a comfort and a treat all in your pjs! Wow – will save for a special occasion later this fall. You take such excellent photos of your food, too! Love the creamy factor of the sauce. It looks super decadent. It'd work on anything. I love mushrooms and this dish looks amazing. Definitely made my mouth water! Oh man Kevin, these look so good! Portobellos are our favorite. Love the sauce! The only thing better than mushrooms in a dish is two different kinds of mushrooms in a dish. This looks delicious, Kevin. I just found your brilliant blog via Twitter. What a great find! Your recipes are incredible and would all fall into the category my husband and I call "taste-explosions". I have signed up to receive your posts so I won't miss out on anything. wow, this looks like it has such a delicious rich flavor! WOW Kevin this one looks delicious! I love how you incorporated dried porcini's into the sauce. If one did not have access to dried porcini's what would you suggest to use in its place? Oh my GOSH this looks amazing! Stellar photographs! I love anything with mushrooms, and the heavy cream just adds to that love. Love this recipe Kevin. Definitely bookmarking since we adore mushrooms. Thanks! Wow, this looks so tasty, can't wait to try it. Looks heavenly. Mushrooms and cream simply "go" together. Mushrooms Canada: If I did not have access to dried porcini mushrooms I would use some finely chopped button or cremini mushrooms. They would not pack as much flavour but they would still be really good! This is beautiful! I love it! I can't wait to try this one. Healthy and delicious at the same time. Anonymous: Yes, that should be 1/3 cup parmigiano reggiano (grated). Thanks! Is it just me, or do comments usually help one decide if the recipe TASTES good? Maybe I missed something, but it doesn't look as if anyone has tried this recipe and then commented on it.